Beto O’Rourke’s first TV ad is out today. But he’s quietly been in print and radio for months. "Beto O’Rourke’s first TV ad is out today. But he’s quietly been in print and radio for months." was first published by The Texas Tribune, a nonprofit, nonpartisan media organization that informs Texans — and engages with them — about public policy, politics, government and statewide issues. Over the last year, U.S. Rep. Beto O'Rourke's bid to unseat U.S. Sen. Ted Cruz has drawn national fanfare as a thoroughly modern, digital-first campaign. He regularly draws an audience of thousands to his Facebook page by livestreaming mundane moments on the campaign trail, and he has outpaced most every other campaign in the country with the millions he's spent on digital advertising. Yet the El Paso Democrat has been also waging a more under-the-radar effort via more old-school mediums. For the past few months, O'Rourke's campaign has been running ads on local radio stations and in certain publications in an effort to court voters he may be less likely to reach online, part of a six-figure investment to supplement his already-robust presence online. It has unfolded ahead of O'Rourke's biggest foray into paid, non-digital media yet — a $1.3 million TV buy that is set to begin Wednesday across the state. But in some communities, it will not be the first time they have seen or heard O'Rourke advertising offline. The radio ads, which have not been previously reported, have fallen into at least two categories: spots that advise listeners of an upcoming O'Rourke appearance in their area and a half-minute commercial in which he introduces himself as the candidate "running against Ted Cruz for the Senate because I believe in the people of Texas." "I know that working together we can get after the big, bold, ambitious goals before us," O'Rourke continues. "We can make sure that every single one of us can see a doctor, find a job, reach our God-given potential. I know that we can reform the criminal justice system, achieve equity and access to education, and we can treat everyone with respect and dignity. Among the radio ads that O'Rourke has run to get out the word about his events have been in the Rio Grande Valley, where he has acknowledged he needs to do better after losing some counties there to a little-known opponent in the March primary. For example, back in May, O'Rourke ran minute-long radio ads on McAllen stations in the hours before he went block walking and held a town hall in the border city. "Our economy isn't working for everyone when black Americans have 10 times less wealth than white Americans," reads one of the print ads. "Let's level the playing field by ensuring access to good jobs, higher pay, skills training, and a fair shot at economic success." The radio ads are being placed by Judy Foston, president and founder of the Richmond-based public relations firm Foston International. O'Rourke's campaign paid the firm $136,182 from early May through the end of June, according to Federal Election Commission records. O'Rourke's campaign said the radio and print ads were part of an effort to make sure all Texans are included in his campaign. "We’re trying to make sure that our campaign that we’re running across Texas in all 254 counties is reaching everybody and making sure everybody knows that they’re welcome in the campaign to share their ideas, to ask questions," O'Rourke spokesman Chris Evans said. "In order for us to listen and to learn, we have to make sure that everybody knows we’re there." The scope of radio and print advertising by Cruz in the race, if any, is not entirely known. Earlier this year, after both candidates won their primaries, Cruz released a country music jingle needling O'Rourke over his name, among other things, and while Cruz's campaign described it as a "statewide radio ad" at the time, it did not provide additional details such as where it was airing and how much the campaign was spending on it. In any case, TV advertising in the race is about to kick into high gear. In addition to the O'Rourke buy that starts Wednesday, a pro-Cruz super PAC, Texans Are, is set to go on the air after Labor Day and stay up in at least three markets through Election Day. Cruz's campaign launched its first TV ads earlier this month. Beto O’Rourke’s first TV ad is out today. But he’s quietly been in print and radio for months. By Patrick Svitek August 15, 2018 Over the last year, U.S. Rep. Beto O'Rourke's bid to unseat U.S. Sen. Ted Cruz has drawn national fanfare as a thoroughly modern, digital-first campaign. He regularly draws an audience of thousands to his Facebook page by livestreaming mundane moments on the campaign trail, and he has outpaced most every other campaign in the country with the millions he's spent on digital advertising. Yet the El Paso Democrat has been also waging a more under-the-radar effort via more old-school mediums. For the past few months, O'Rourke's campaign has been running ads on local radio stations and in certain publications in an effort to court voters he may be less likely to reach online, part of a six-figure investment to supplement his already-robust presence online. It has unfolded ahead of O'Rourke's biggest foray into paid, non-digital media yet — a $1.3 million TV buy that is set to begin Wednesday across the state. But in some communities, it will not be the first time they have seen or heard O'Rourke advertising offline. .@BetoORourke TV ad now airing: pic.twitter.com/bV4y7UM8pn — Patrick Svitek (@PatrickSvitek) August 15, 2018 The radio ads, which have not been previously reported, have fallen into at least two categories: spots that advise listeners of an upcoming O'Rourke appearance in their area and a half-minute commercial in which he introduces himself as the candidate "running against Ted Cruz for the Senate because I believe in the people of Texas." "I know that working together we can get after the big, bold, ambitious goals before us," O'Rourke continues. "We can make sure that every single one of us can see a doctor, find a job, reach our God-given potential. I know that we can reform the criminal justice system, achieve equity and access to education, and we can treat everyone with respect and dignity. O'Rourke says in conclusion that he approves the message "because I want to make your fight my fight.” (Audio unavailable. Click here to listen on texastribune.org.) Among the radio ads that O'Rourke has run to get out the word about his events have been in the Rio Grande Valley, where he has acknowledged he needs to do better after losing some counties there to a little-known opponent in the March primary. For example, back in May, O'Rourke ran minute-long radio ads on McAllen stations in the hours before he went block walking and held a town hall in the border city. At least some of the radio and print ads appear to be aimed at black voters. The 30-second radio spot has aired on urban contemporary stations like KGGR in Dallas and KHVN in Fort Worth, and the print ads have shown up in African-American newspapers such as the Houston Defender and Dallas Examiner, touching on issues including jobs, education and health care. 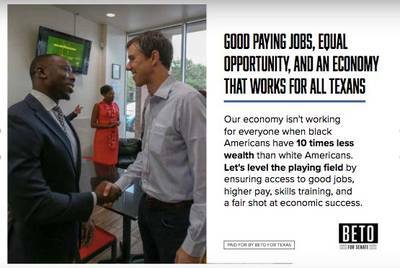 A Beto O'Rourke ad in a recent issue of the Houston Defender "Our economy isn't working for everyone when black Americans have 10 times less wealth than white Americans," reads one of the print ads. "Let's level the playing field by ensuring access to good jobs, higher pay, skills training, and a fair shot at economic success." The radio ads are being placed by Judy Foston, president and founder of the Richmond-based public relations firm Foston International. O'Rourke's campaign paid the firm $136,182 from early May through the end of June, according to Federal Election Commission records. O'Rourke's campaign said the radio and print ads were part of an effort to make sure all Texans are included in his campaign. "We’re trying to make sure that our campaign that we’re running across Texas in all 254 counties is reaching everybody and making sure everybody knows that they’re welcome in the campaign to share their ideas, to ask questions," O'Rourke spokesman Chris Evans said. "In order for us to listen and to learn, we have to make sure that everybody knows we’re there." The scope of radio and print advertising by Cruz in the race, if any, is not entirely known. Earlier this year, after both candidates won their primaries, Cruz released a country music jingle needling O'Rourke over his name, among other things, and while Cruz's campaign described it as a "statewide radio ad" at the time, it did not provide additional details such as where it was airing and how much the campaign was spending on it. In any case, TV advertising in the race is about to kick into high gear. In addition to the O'Rourke buy that starts Wednesday, a pro-Cruz super PAC, Texans Are, is set to go on the air after Labor Day and stay up in at least three markets through Election Day. Cruz's campaign launched its first TV ads earlier this month. Read related Tribune coverage Beto O’Rourke says he'll start airing TV ads with money raised off Ted Cruz’s attack ads Cruz allies ramp up for November TV battle with O'Rourke Win or lose, Beto O’Rourke’s campaign against Ted Cruz could shape Texas politics for years "Beto O’Rourke’s first TV ad is out today. But he’s quietly been in print and radio for months." was first published at by The Texas Tribune, a nonprofit, nonpartisan media organization that informs Texans — and engages with them — about public policy, politics, government and statewide issues. Link back to the original article, which is located at https://www.texastribune.org/2018/08/15/shadow-digital-ad-push-orourke-has-targeted-voters-radio-print/.